McElwain has been released from his contract and has been hired as the head coach of the University of Florida football team. In return, Colorado State will get a buyout totaling $7 million. Florida will contribute $3 million over six years, McElwain will contribute $2 million (unknown time frame), and $2 million will be paid for a future game between the two schools in Gainesville. The agreed-upon buyout is the largest in college football history. WE'RE NUMBER ONE!! WE'RE NUMBER ONE!! Offensive coordinator Dave Baldwin has assumed head coaching responsibilities in the interim, including our upcoming bowl game. Tony Frank, with the assistance of Interim Athletic Director John Morris, began a nationwide search for a new head coach. According to Morris this afternoon, the athletic department had received between 40 and 50 inquiries about the position. Tony Frank held strong as Jeremy Foley pressured him to reduce the buyout. The publicity of the whole matter should have provided Florida with all the leverage to negotiate down the buyout. However, the buyout ended up reducing by only $500k. That is on TFrank. What a stud. Thankfully, I did not have to lose any faith in that man. If this were Twitter, I would say #TonyFrankIsMyPresident. Jon of Jon of all Trades sent me this article, which explains the resolve of our fine president. If the negotiations on the buyout had failed, I do not know how McElwain could have returned to coaching at CSU. It would have been impossible for him to recruit players knowing that he was looking to leave on the next plane out of town. I'm not sure that I agree with how Jim McElwain handled the whole situation. From what I could gather from those journalists following the events closely, his players were in the dark until after ESPN reported that the deal was finalized. Maybe McElwain was unsure if the buyout could be negotiated, but the players and his coaching staff deserved to know what was going on. As much as I deny it to myself and others, I knew that McElwain was going to leave (despite my longing for second Sonny Lubick tenure). It was the timing that surprised me. I was shocked that the courting by a power team in a power conference happened this year. After another successful season in 2015? For sure. But not after one great year. In my last post, I called CSU a "stepping stone" school. Is it really? Besides Jim McElwain leaving for the money and grandeur of the SEC, only one other coach in recent history has left for greener pastures (Tim Miles to Nebraska, at the "greener" part is debatable). Sonny Lubick was declining rapidly when he was let go. Steve Fairchild was 3-9 for three straight seasons when he was let go. Maybe CSU is not such a stepping stone school after all. . . This whole situation would have gone differently if Jack Graham were still at the helm. With his passionate and fiery demeanor, it may have actually been much uglier than it ending up being. The hiring of the next coach should be interesting for a couple reasons - first, we do not have a true athletic director. John Morris has been the interim AD since the firing of Jack Graham, but he admitted at his press conference today that Tony Frank would be leading the hiring process with Morris' assistance. The lack of stability at the AD position may be an issue for an incoming coach. Secondly, it is tough to envision a football coach search with a team that has a record of 10-2. That record makes the job a lot more enticing to those quality coaches looking for a new position. I truly believe that Dave Baldwin will be retained as the head coach for next year. He has been an integral part (if not the most integral part) of our success on the offensive side of the ball. No other FBS school has a quarterback/wide receiver/running back combo that we have in Grayson/Higgins/Hart. Plus, Baldwin has previous head coaching experience and our questions at the AD position make this an easy and safe choice. Hopefully it is a smart choice as well. I cannot tell you how many people stopped by my desk today to make sure I was okay. 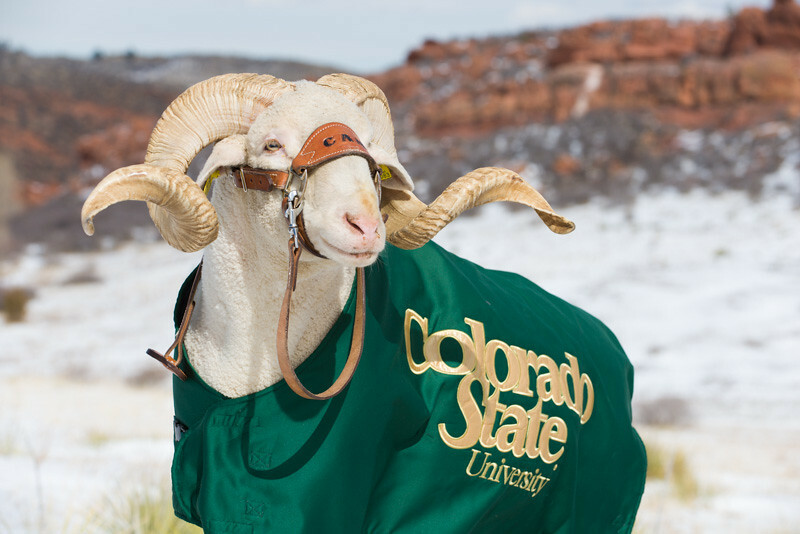 Clearly, I display my loyalties toward CSU loudly and proudly. Shockingly, I took the news far better than a lot of people I know and countless people that I do not know that I encountered on social media. Based on some of the reactions, you would have thought we were eliminating the football program like poor UAB. Poaching of your coach by an SEC team means that you are doing something right. A lot of people had issue with McElwain leaving the program just months after talking about CSU as his home. I cannot blame the man for leaving - the pay increase and chance to compete for a national championship are both incredibly enticing. I wish him all the success in the world, except when they play us in a few years. If you question his motives, that is your deal. The players that were sitting in that locker room today when he broke the news to them all came out of that meeting with the same message - they were thankful for the time they had with him, they were excited to move forward toward a bowl victory, and they understood why he made his decision. Let's hope that the climb continues and we continue to make strides toward national relevance on the gridiron. I really hope that the person responsible for those "The Grind" videos sticks around. They are incredible. Check them out. Any chance we can slide into the Pac12 or Big12 now?!! Colorado State University is not part of the Power Five conferences. While the SEC, Pac12, Big12, Big10, and ACC sit at the big boy table, our Mountain West Conference gets to wait outside for whatever scraps are thrown our way. This disparity was displayed quite clearly as the College Football Playoff rankings were released this year. Despite the records of Colorado State and Boise State, three and four loss teams from the Power Five conferences were consistently ranked in the top 25 above any MWC team. Where the Mountain West does have a huge amount of value is apparently grooming the next round of Power Five coaches, the latest of these being McElwain. This whole event has highlighted yet again that CSU is considered a "stepping stone" school, only there to move on to a higher profile and more lucrative position. When McElwain signed his contract, it included language for a significant buyout. At this point in time, that buyout is valued at $7.5 million. The buyout was inserted into the contract for one very specific reason. It was meant to deter other teams from trying to lure our coach away from Fort Collins. Our AD at the time of the contract signing, Jack Graham, made sure that the language dissuaded any changes to that buyout. Our coach was here to stay. During the chaos yesterday, an article appeared online that during the finalization of the contract, the President of the university agreed to negotiate that buyout amount in the event that McElwain's "dream job" became available. Again, the specifics of this are not entirely known as this information is mostly coming from Jack Graham. Should the deal with Florida go through and McElwain departs, I am interested to see what happens with that buyout. Right now, it seems like it did not accomplish what it was meant to accomplish. I have had a steadfast belief that Tony Frank was and is a great university President. He is engaging, active in the University, and has lead the entire campus in a positive manner. If he truly did make a handshake agreement to negate the terms of the McElwain's contract that were explicitly agreed upon to protect the interests of CSU, my respect for the man will take a hit. I understand that there were multiple issues that led to the termination of Jack Graham's contract as Athletic Director. However, his indelible mark on the department was twofold: a complete change in attitude about where we should be going in terms of athletics (Bold New Era) and an uncanny ability to hire and retain quality coaches. He was directly responsible for the hiring of McElwain from Alabama, Larry Eustachy (MBB) from Southern Miss, and Ryun Williams (WBB) from South Dakota. All three hires have produced a better on-field or on-court product since before their arrival. If McElwain truly does bolt for the SEC, it would have been great to have Graham in place to hire his successor. The logical next step is to start talking about who is the next coach of the CSU football team. Dave Baldwin is the clear internal favorite; he has previous head coaching experience at SJSU and has created a top-25 offense this season. Another interesting name that has popped up is Bob Stitt from Colorado School of Mines. I doubt this happens because without an established AD, I don't see any risky hires being made. Hiring a successful D-II coach and noted offensive guru would be an interesting proposition. Considering he is coming from a lower tier program, he might be content to actually stick around for a while. I had hopes that Jim McElwain was a reincarnation of the greatest CSU coach of all time, Sonny Lubick. They are good friends, having recruited together when McElwain was an assistant at Eastern Washington. Sonny's conversations with McElwain and his history in Fort Collins were a large reason why McElwain accepted the CSU job in the first place. During his successful tenure at the help, Sonny was also desired by other programs in the top conferences (most notably Miami, where he had been a defensive coordinator). Each time an opportunity arose, Sonny respectfully declined as he loved Colorado State, he loved Fort Collins, and his wife was not moving anywhere! At his introductory press conference, McElwain spoke about that same path that Sonny had laid out for him. Here he was in a great city with a great university heading up what could be a great football program. Fast forward three plus years and we are (potentially) seeing where the true loyalties of our head football coach lie - the SEC and cash money. This is the part that upsets me the most. Here is a guy who was given a chance to be the head football coach of a D-I school. His mentor and friend established the criteria for how coaches are judged in Fort Collins. He talked the talk and then bailed when the money came. So frustrating. That being said, would I turn down the pay raise that he is bound to receive? What are your thoughts on the chaos surrounding CSU? Apparently Tony Frank is holding strong to the buyout amount identified in the contract. Keep doing what you do, TFrank. Thanks, Robert, for the link to the article.